There are a number of movies in this blog that I talk about that aren't necessarily great films, but they're fun movies. "Toy Soldiers" is one of those movies. 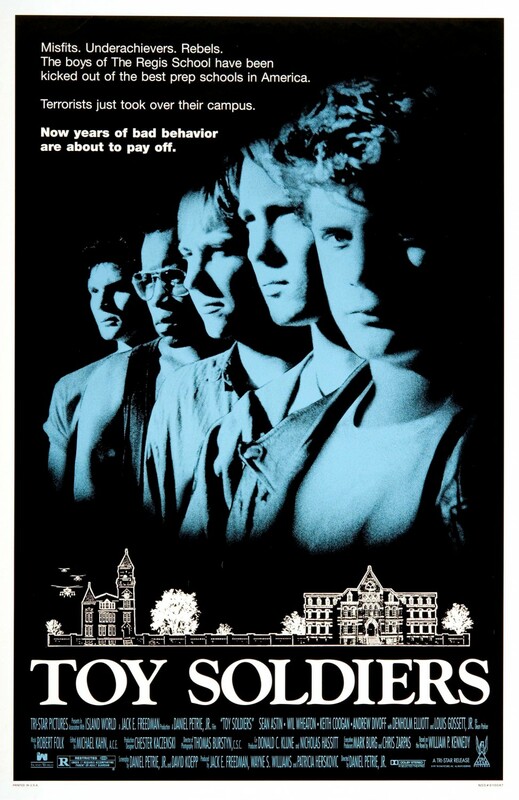 The premise of the film is that terrorists take over a private boarding school full of the worst of the worst rejects, the people who've been kicked out of lots of other boarding schools. They decide they're going to fight back. Now, keep in mind, despite the semi-campy concept, this is a thriller. There are parts of it that can be lighthearted, but this is a film that isn't afraid to show people getting killed, and isn't afraid to shirk away from the consequences of people's actions. It's shot in that sort of minimalistic style of the late 1980s, which makes it funny that it came out in 1991. It's nothing to write home about visually. In fact, none of the pieces by themselves are really all that remarkable. The dialogue veers from good to cornball and back again on a dime. The actors are trying to make the hodgepodge of Ferris Bueller's Day Off meets Red Dawn work for them, and are mostly succeeding. The whole thing comes together into something that's better than it's parts. It seems like on paper that it shouldn't work, and yet, I watched this movie a number of times on HBO during the early 1990s. It would come on some Saturday afternoon and I'd sit and watch it all over again. Of course, no one had any idea how to market it, and it didn't get a big audience, but it's still worth a Saturday afternoon of yours, too.